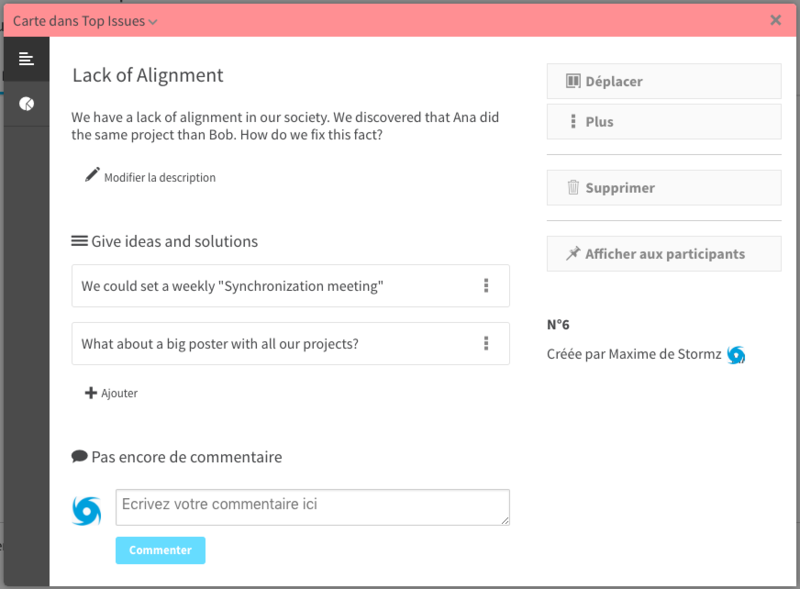 To share thoughts, co-create solutions and take collaborative decisions. No time to prepare your session? 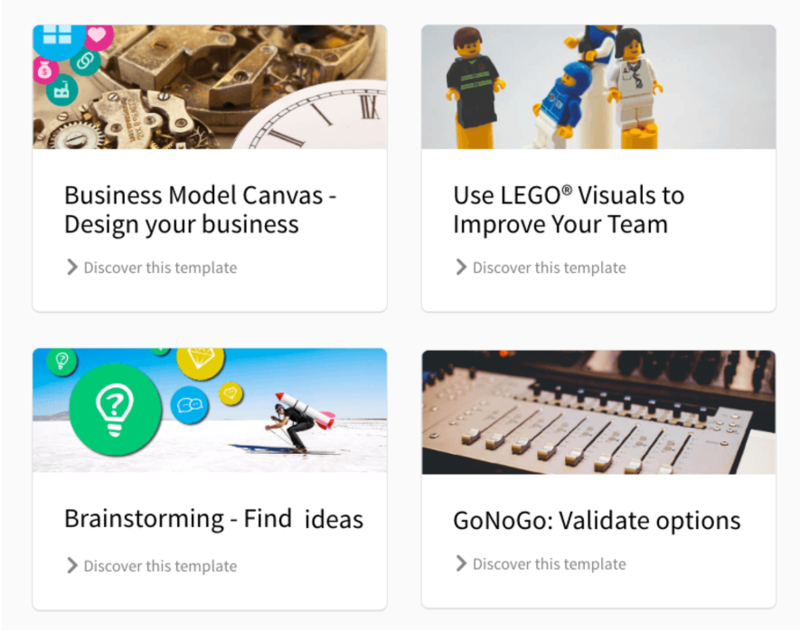 No problem, you can choose from our 50+ workshop templates to setup your session very quickly. Co-design solutions thanks to our brainstorming, creative problem solving and design thinking workshops. Converge towards a consensus with your teams thanks to our decision-making, strategic planning or collaborative learning workshops. 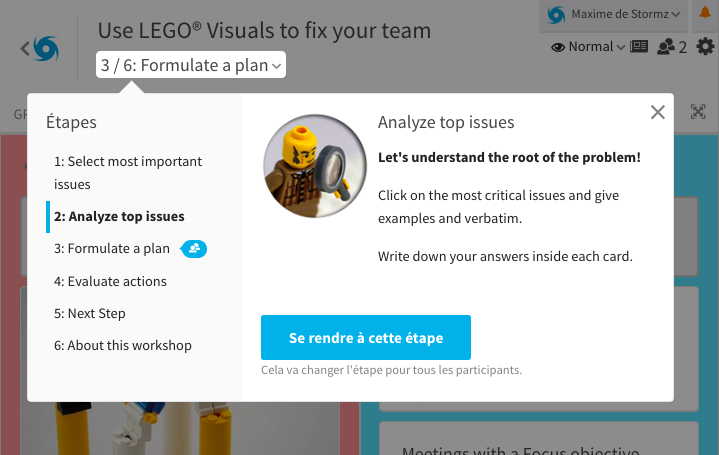 A Workshop is divided into any number of configurable steps enabling you to design a perfect flow for your session and setup the best way to foster collaboration and manage group biases. Decide, for every step, what's authorized and what's displayed to control what your participants can do and see. The cards are the fundamental artefact of a Stormz Workshop. Participants create cards with their own ideas and enrich those of others. A card can start as a simple one sentence idea and evolve into a full blown detailed concept. The Content. Detail and enrich a card. The Description to explain, in a few short sentences, an idea or a thought. The Sections for participants to collaboratively turn a rough idea into a full blown concept. The facilitator can create any number of sections, give them a title (such as "Pros", "Cons", "Improvements") and decide in which step(s) they are going to appear. The Comments to freely react and start-up discussions on a card. The Actions. Interact with the card. 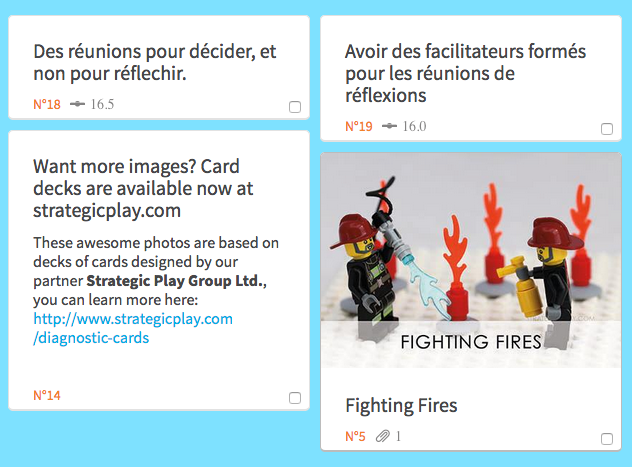 Add a Picture to illustrate your card with a picture of your prototype or drawing. You can even add a selfie! Add a File to provide sources, references or document that support your idea. Vote and Evaluate so that everyone can assess the card. You can also show, hide, move, duplicate and even merge several cards! You can perform these last actions from within the card or do mass actions by selecting several cards from one of the views. Each and every card is part of a group! This enables you to categorise your ideas, structure your creative process and differentiate different types of contributions. The cards of the groups can be mixed up in an indistinguishable way. A great feature to organize a vote without taking into account the origin of each card. Spatially organize the groups within a matrix (2x2, 2x3), several columns or a more complex canvas such as the Business Model Canvas. Instantly create a Word Cloud out of the content of the cards. Click on a word and display all the related cards! 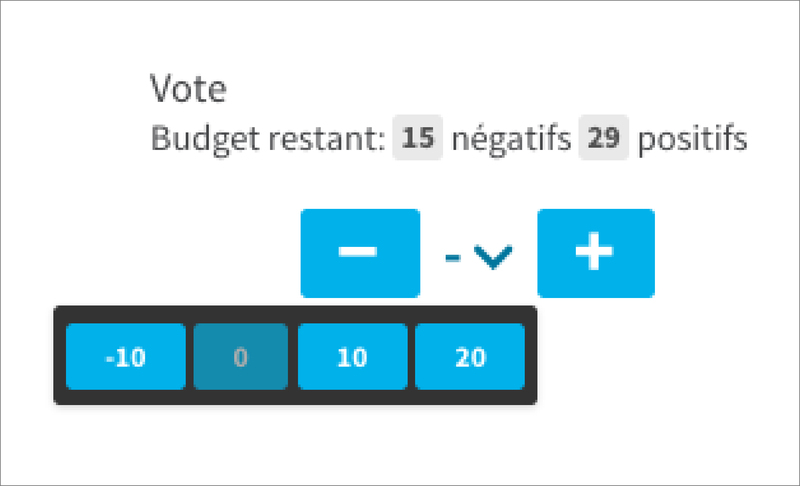 Depending on the way you setup the vote, you can implement very different dynamiques: from a simple Like to a more sophisticate $100 budget game. 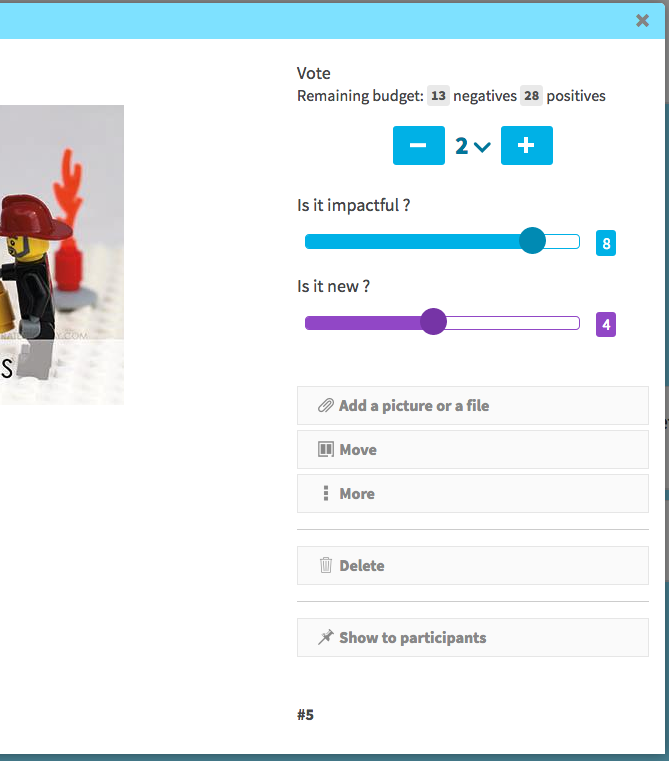 - The Budget helps you determine how many positive or negative points your participants can spend. - The Limit enables you to configure the maximum number of points that can be given to a card. - Positive and/or Negative points? Using both enables to better evaluate if there is a consensus around an idea. On the contrary, using only positive points foster positive thinking. The decision is up to you! 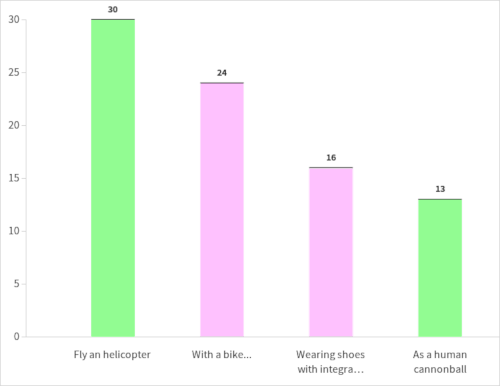 During or after a vote, the results can be displayed in a bar chart. This enables you to see the points gap between the cards and rank them accordingly. You can also sort out the cards by score in the other views. You can choose as many criteria as you wish to evaluate and analyse, perform a multi-criteria analysis on the ideas. - The scale. "From 0 to 10" or "1, 3, 6, 9" or other; pick the most relevant scale. - The weight to prioritize the importance of the criteria. When you display the results, live, with the bubble graph, every card is represented by a bubble. With the other views, you can sort out the cards according to the weighted sum or the average score of each criteria. You won't ever spend a whole night trying to decipher illegible Post-it notes ever again! Export all the data gathered during the vote and evaluation in the format of your choice (PDF, Word or Excel). Group biases? You can avoid them. You can choose not to show the cards, votes and evaluations of other participants so that they stay focused on their own and don't get influenced by others' inputs. During a vote or an enriching phase, randomly mixing up the cards will help participants not to focus exclusively on the first ones displayed. Every card's author is hidden from other participants: the boss's card becomes undistinguishable from all the others, thus neutralizing hierarchical biases. 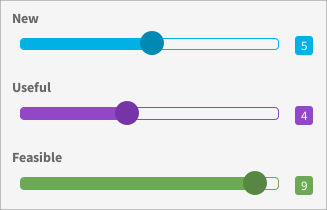 Depending on your facilitation dynamics, choose to show only one type of map and a selection of groups based on the current stage. Design your workshop much quicker by re-using the steps you've already created or those included in the Templates. Apart from the Participants, you can name Observers and Facilitators to support you in your animation. Within each card, you can see the details of the evaluations and the distribution of the votes. Follow what your participants are doing and consult the history of all past actions. Are you a developer? Combine Stormz with other tools. Use our API.